Adare bed & breakfast accommodation has been welcoming visitors to Adare for many years. Stay in the village close to the hotels, restaurants and bars or relax in the beautiful countryside on the outskirts. Adare Country House opened in June 2001 and aims to offer luxury accommodation in a warm and friendly environment. We are located in the village of Adare, just three minutes walk from Main Street. A warm welcome awaits you and your hosts Denis & Eileen Moroney will be happy to help in organising all your activities during your stay. A warm welcome awaits you at Adare Country House and your hosts Denis & Eileen Moroney will be happy to help you in organising any activities during your stay. 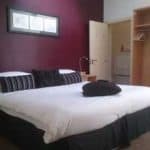 All rooms are very spacious and have been personally decorated to the highest standards by your hosts, each room has a private bathroom, tea & coffee making facilities and hair dryers. All rooms have TV and free wi/fi. Guests can choose from a wide range of fresh home-made breakfasts and are welcome to relax in either the guest TV lounge or the reading room. Surrounded by manicured gardens it is easy forget that you are in the village. Family rooms are also available. Denis, Eileen & the Moroney Family look forward to greeting you in Adare Country House soon. Award winning Carrabawn boasts six luxurious guestrooms, set in the village of Adare along the Killarney road. All with private bathrooms, flat screen TVs, complimentary wifi, hospitality tray, car parking, set amongst landscaped gardens. Self-catering facilities are also available. 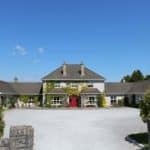 Carrabawn is an award winning family run guesthouse offering luxurious accommodation in the village of Adare. We are renowned for offering our guests a high standard of service in warm friendly surroundings. Our six guestrooms feature every modern convenience, private bathroom, flat screen TVs, tea/coffee making facilities and complimentary wifi. We are proud of our extensive & delicious breakfast menu in our dining room, overlooking winning gardens where you sometimes see our free-range hens lurking about. We offer our guests private parking, information on tours and outdoor activities in the area. Rates from €30 per person sharing, €45 single occupancy, family rooms available. We also have two self-catering units. Your hosts are the Lohan family. Superb warm spacious home away from home. AA and RAC Awards. Private parking; delicious breakfast menu. Only a three minute walk to churches, shops and hotels. Turn at the roundabout in the village. Early/Late arrivals are welcome. Luxury accommodation situated in the centre of the picturesque village of Adare. Rooms en Suite, with TV, and tea and coffee facilities in rooms. Delicious breakfast served in our dining room. TV Lounge and Private Car Parking. Wifi available. Only a 3 minute walk to Churches, Restaurants, Hotels, Adare Manor Grounds & Adare Heritage Centre. Golf, Fishing, Horse Riding, Pony Trekking nearby. 30 Minutes to Shannon Airport. Centrally located for tours of the Burren in County Clare, Limerick, Kerry and Cork. Rates from €42.50 to €45.00 per person sharing. Single rates from €65.00 to €70.00. Your host Bridie Herlihy looks forward to hearing from you soon. The Adare Village Inn is a luxury townhouse located in the heart of the village of Adare, opposite the village green. It is an ideal location for those looking for accommodation close to all amenities and an ideal place to stay if attending a wedding. All rooms are south facing and are en-suite with power showers equipped. Off street parking is available. Situated in the heart of the village making it ideal for those travelling by public transport or car, with the bus stop just 150 metres away. Adare is regarded as the gateway to the South West and West of Ireland. From Adare you can travel within one hour by bus to Tralee, Killarney, Blarney, Limerick City and Shannon Airport. Sean & Bridie look forward to hearing from you soon. Family run B & B accommodation situated on the outskirts of the village of Adare, Ireland’s most picturesque village. Only 5 minute walk to the village and a short distance from Clonshire Equestrian Centre, two golf courses, river fishing and pitch and putt. Family run B & B accommodation situated on the outskirts of the village of Adare, Ireland’s most picturesque village. All rooms are en Suite, with TV. Tea and coffee facilities. Full Irish breakfast served. TV Lounge and extra-large private car park, and coach parking facilities. Only 5 minute walk to the village and a short distance from Clonshire Equestrian Centre, two golf courses, river fishing and pitch and putt. 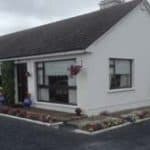 Located on the Askeaton Road and in close proximity to Curragh Chase. Ballycannon Lodge offers a warm welcome, great family facilities and beautifully appointed bedrooms. 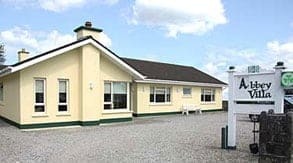 Located in the peaceful village of Croagh, Ballycannon Lodge is just a 5 minute drive from the beautiful village of Adare and is only a 20 minute drive from Limerick City. 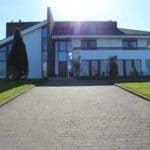 Ballycannon Lodge offers a warm welcome, great family facilities and beautifully appointed bedrooms. 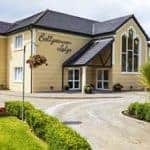 Located in the peaceful village of Croagh, Ballycannon Lodge is just a 5 minute drive from the beautiful village of Adare and is only a 20 minute drive from Limerick City. Our central location means that Irish landmarks such as the Lakes of Killarney, Ring of Kerry, Dingle Peninsula, Cliffs of Moher and the Burren are all within easy travelling distance. Given our close proximity to Adare, Ballycannon Lodge is the perfect location for an overnight stay if you are attending a wedding in the village. Guests can choose from single, double, triple or family bedrooms and our traditional Irish Breakfast is served daily from 7am – 12 noon. All our rooms are en suite with a bath and shower facilities and are warmly decorated and spacious. A complimentary tray of tea, coffee, bottled water and light snacks are refreshed daily. All rooms include air conditioning, iron, hairdryer, free WIFI and multichannel TV. Located in the heart of the village of Adare, Aspen House is just a minute’s walk from the main street. With such a wealth of things to see and do on your doorstep, Aspen House is the ideal place to base yourself for a vacation in the mid-west of Ireland. Located in the heart of the village of Adare, Aspen House is just a minute’s walk from the main street. With such a wealth of things to see and do on your doorstep, Aspen House is the ideal place to base yourself for a vacation in the mid-west. We are only 30 minutes from Shannon Airport. We serve a choice of breakfasts, cooked or continental with fresh fruit and our house favourite is the full Irish breakfast. Enjoy our guest lounge which is both spacious and comfortable with satellite TV. Complimentary tea and coffee are served on your arrival. All our Rooms are en-suite with orthopaedic beds, TV and a hairdryer and we provide free wireless internet access. Aspen House is close to all amenities and is within walking distance to churches, hotels, restaurants and bars, with a bus stop nearby. We provide free private car parking for our guests. Our rate starts from €35 per person per night. Proprietor Patricia Smith looks forward to your enquiries. Hazelwood Country House is a beautiful modern home with fully serviced ensuite bedrooms and magical views. Homely Bed & Breakfast with free secure parking, wireless internet, pet facilities, wheelchair access and lots of country tranquility. Hazelwood Country House is a beautiful modern home with fully serviced ensuite bedrooms and magical views. Homely Bed & Breakfast with free secure parking, wireless internet, pet facilities, wheelchair access and lots of country tranquility. Located only 10 mins from Adare and 30 mins from Shannon Airport, Hazelwood Country House is a beautiful place to relax and use as a base for the region. We are next door to Curragh Chase Forest Park and Stonehall Visitor Farm. 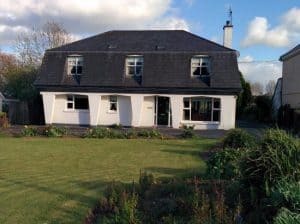 Located just off the Adare to Kildimo road (google Hazelwood Country House) Hazelwood allows easy access to the N69 Wild Atlantic Way, Foynes and the beautiful river Shannon. Nearby walking, cycling, fishing, golfing and equestrian facilities. B&B rates: €90 per couple and €70 single. Host Anne offers a warm reception and assistance. 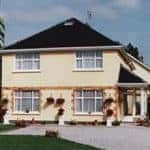 Abbey Villa is a warm spacious family run guest house located on Station Road in Adare, Ireland’s prettiest village/heritage town. Abbey Villa is only a very short stroll to shops, bars, hotels and Adare’s famous thatched cottages. We are recommended by Frommers International Guide. 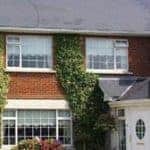 Abbey Villa is a warm spacious family run guest house located on Station Road in Adare, Ireland’s prettiest village/heritage town. All 6 bedrooms are ensuite with TV, hairdryers and orthopaedic mattresses. We also provide private off road parking for your convenience. Early arrivals are welcome (we would appreciate it if you could advise us in advance where possible). We are fully approved by Failte Ireland and we are also members of the Ireland B&B Network. We are recommended by Frommers International Guide. Your host Vincent Jordan looks forward to hearing from you. Coatesland House Bed & Breakfast is situated within walking distance of the historic and picturesque village of Adare in County Limerick. Our house represents the very best of bed and breakfast short stay accommodation in the village. 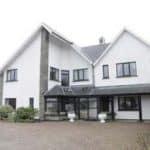 Coatesland House is owned and managed by Florence Hogan and has been a favourite holiday choice for thousands of loyal guests from all over the world. Our house is of cosy warm modern construction but with a traditional Irish feel and traditional Irish welcome. We take pride in our 70% repeat / referral clientele statistics and our personal mission statement is to ensure all our guest’s individual needs & requirements are catered for and that all of our guests leave completely happy. All of our accommodation is equipped with ensuite facilities with power showers in every room and ample hot water. Rooms have television, luxury 100% cotton linens and towels, first quality beds and pillows, tea and coffee making facilities, small refrigerator, Wi-Fi internet, alarm clock radio and hair dryer, sewing kit, shoe polish and reading material and you have stunning views of gardens and distant hills.